In the world of cycling, fat bikes are the latest arrivals to the party, hitting the market just 10 years ago. But companies are wasting no time trying to squeeze every drop of performance possible from these big-footed bikes. 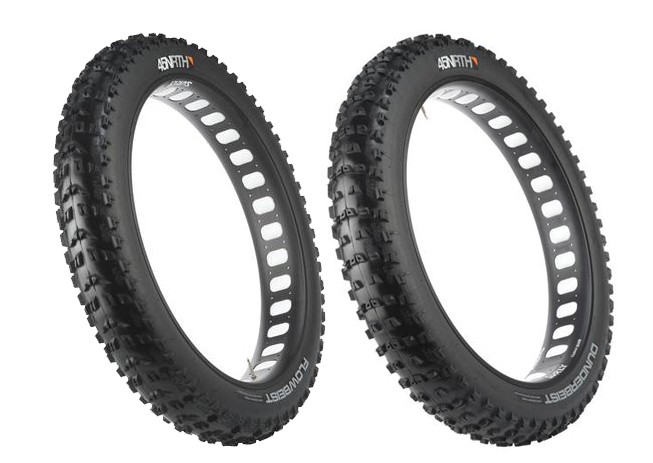 45NRTH, a winter-oriented cycling brand based in Minnesota, today released information about its latest tire offerings — a set of fatties designed for use on the front and rear of the bike. The wide, aggressive Flowbeist (front) and Dunderbeist (rear) tires are designed to be run in tandem. They have front- and rear-specific tread patterns made for low rolling resistance while cruising along but grip while accelerating, cornering and braking. 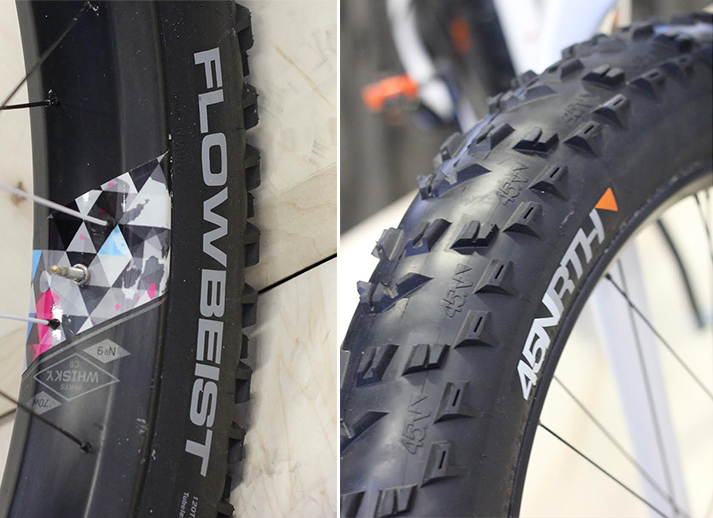 We got an up-close peek today at FrostBike, an industry event in Minnesota. The tires look solid and the tread patterns make sense, with the front and rear each made to do different things. 8.3mm shoulder lugs with gussets and hollow centers add cornering traction. Dunderbeist: Also 4.6”, the rear-specific tread pattern’s perpendicular front and back edges provide braking and acceleration traction while still rolling fast. 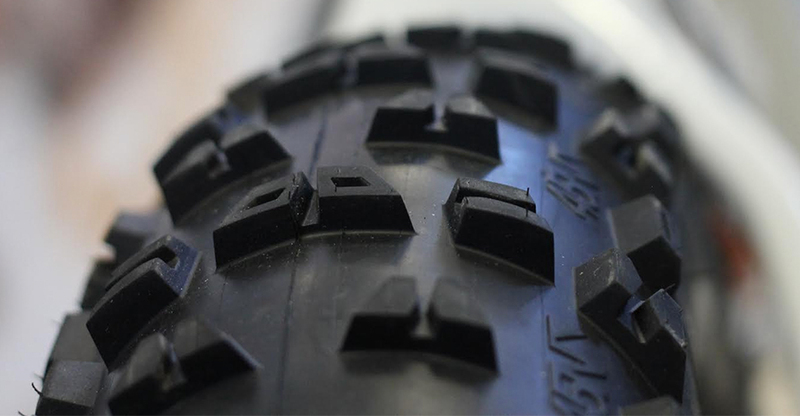 Center treads have “cavities” that increase the number of edges for grip. Lateral grooves on the shoulder knobs enhance stopping and acceleration power while 7.4mm side lugs with fore-aft grooves double the number of edges for cornering stability. 7.8mm shoulder lugs with gussets and hollow centers provide stability in extreme cornering. 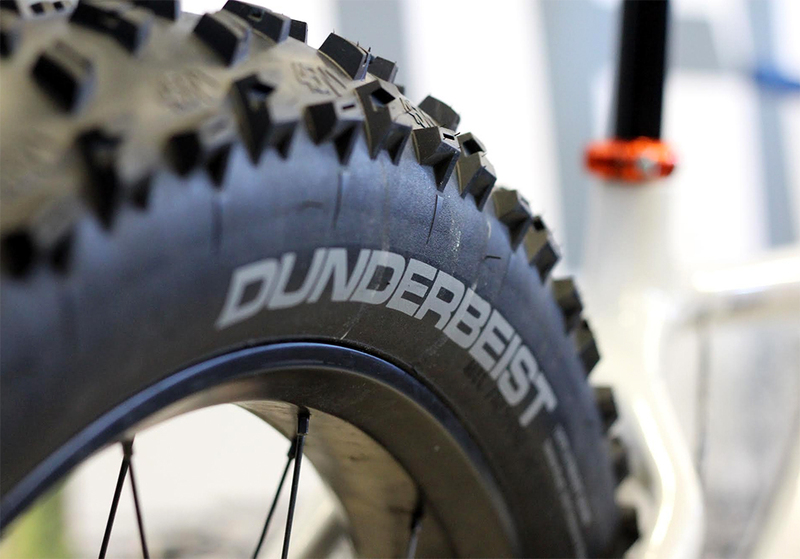 The Flowbeist and Dunderbeist are built with a tubeless-ready bead, creating a fit to allow riders to run super-low tire pressure. Available in a limited release starting in April (with full availability in September). $140 apiece.